Who says that you need a large yard to grow edible plants? 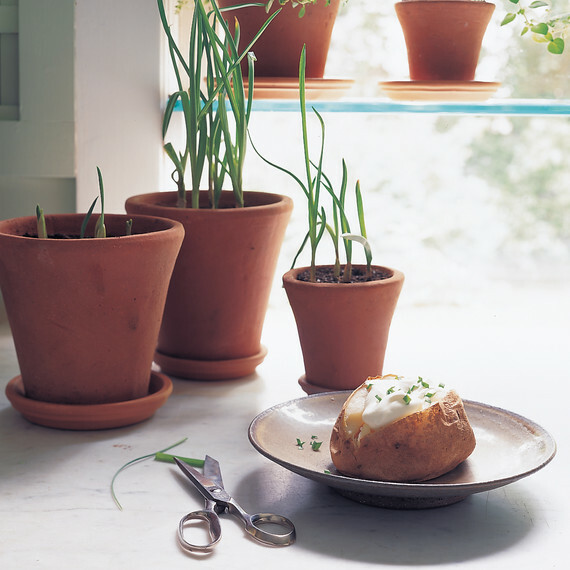 There are many vegetables and fruits that you can grow indoors, even in your own kitchen. These edible plants help you to get fresh produce without worrying about pesticide and chemicals used to grow the plants. Sunny windows in your house and a little bit of extra time on your hands are enough for you to growing your own food at home. Let’s start with the easiest vegetable you can grow right in your kitchen. 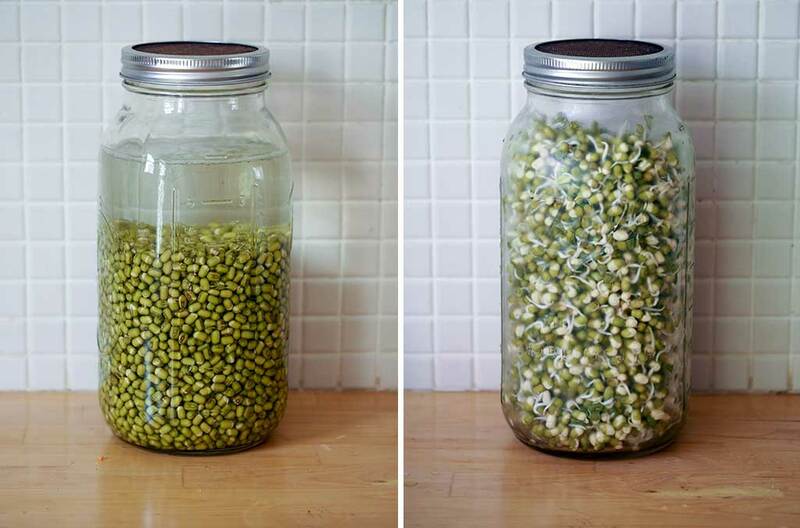 Pick the beans that you want to grow, and soak them in a jar with shallow water, no more than a quarter of the jar. Secure the jar with a mesh or cheesecloth. On the next day, drain the seeds and rinse them, then drain again. Find an area that is dark or gloomy and place the jars at an angle to allow drainage and air circulation through the mesh. Rinse and drain the seeds between two to four times a day; making sure that they never dry out completely. It takes three to seven days for the bean spout to grow big enough (depending on what you’re sprouting). Lentils and mung beans may just take a day or two, while other seeds like wheat berries will take longer. It is best to grow tomatoes outdoors, but it does not mean that you cannot grow them indoors. 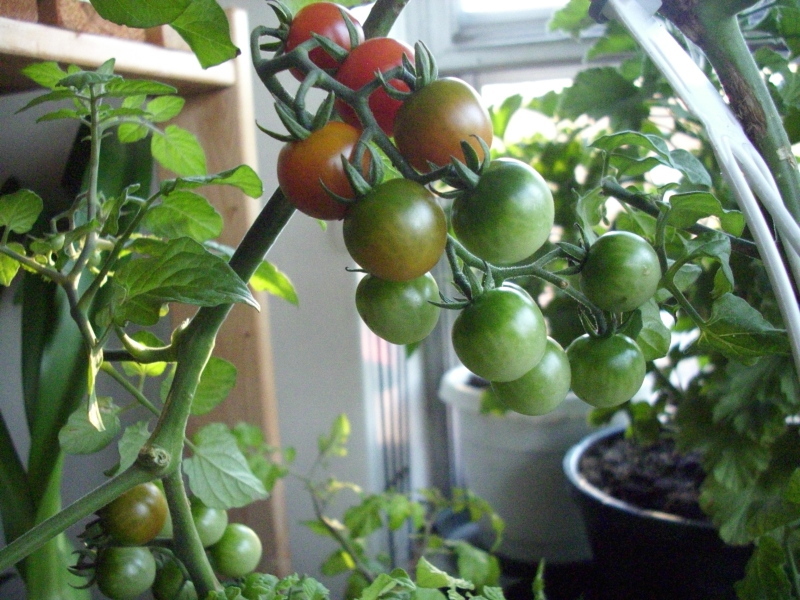 As long as the plants are placed facing the window to enable direct sunlight, tomatoes can grow well inside your house. Start by selecting one six-inch pot (for one plant). Fill the container with starter potting mix and plant seeds about ¼ inch deep. Always keep the soil moist but not soggy. Place the pot in an area that receives substantial sunlight, and do not forget to turning the pot occasionally so all sides have enough access to the sun. You can expect the seeds to germinate in five to 10 days. When the seedlings are about 10 inches tall, transplant them from starter mix to potting soil. As the plants grow larger, they may need to be staked to avoid broken stems. Always keep the soil moist and wait for them to blossom. 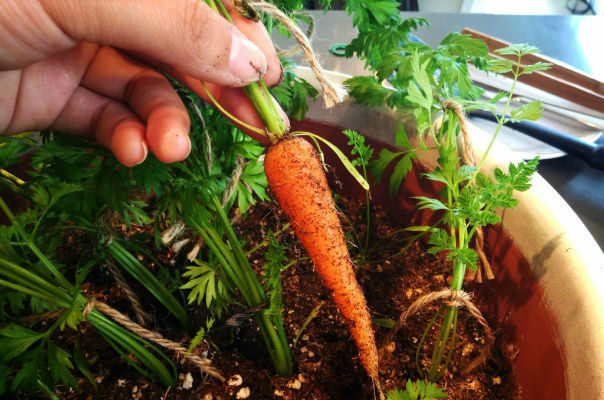 You only need carrot seeds and a pot to grow this vegetable. Fill a pot with loose, sandy potting soil (not heavy garden soil) between 8-12 inches in depth, leaving 3 inches of headroom. Sow the carrot seeds thickly about ¼ inches below the surface. Water well. Place the pot in the area that receives a lot of sunlight. Expect the seeds to start sprouting in about two weeks. Growing actual garlic bulbs indoors is a bit tricky, but you can easily grow garlic greens, which can be used just like scallions. Simply plant three or four cloves in a pot filled with fertile soil. Place the pot near the window to get enough sun exposure. Water the plant daily to keep the soil moist, but not soggy. The garlic greens will grow in 7 to 10 days and can be snipped. Cilantro can be grown from starter plants as well as from coriander seeds. Pick a container that’s at least eight inches deep and has holes in the bottom for drainage. Fill the container with soil, press the seeds into the soil and then water the soil until moist. Cover the container with plastic wrap. In a few days, remove the wrap once the seedlings have germinated and are pushing against the plastic. Water the seedlings every day and keep the container in an area that receives enough sunlight. To harvest, gently snip a few leaves from each plant, and make sure not to remove all the leaves from any one plant. You can grow ginger from only a chunk of ginger you have in your kitchen. 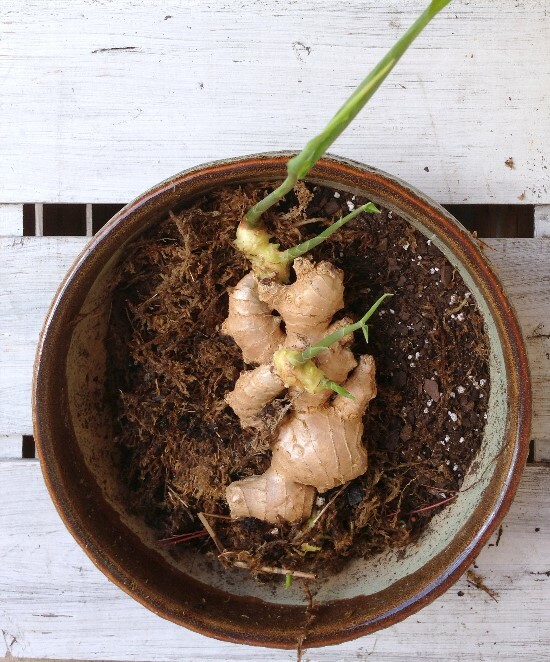 Simply cover the ginger with soil in a pot or container, and make sure the freshest buds are facing up. Place the container in an area that receives indirect sunlight. Keep the soil consistently moist (not soggy) and wait for the new growth to sprout out of the soil. To harvest, pull the entire plant out of the soil and cut off as much as you need. You can replant the ginger using the same process. 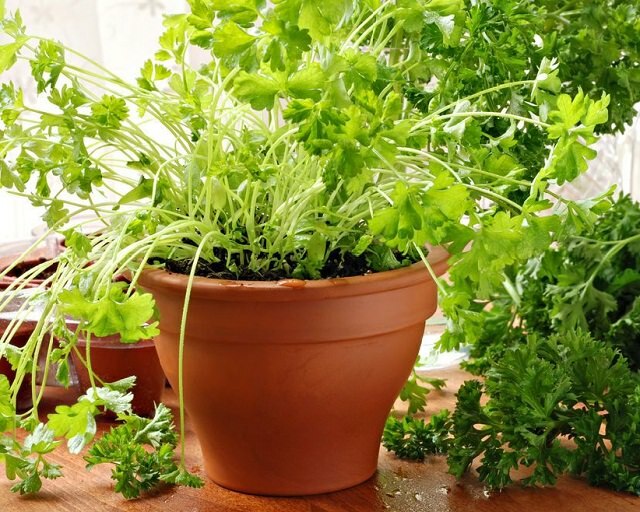 You will take some time to harvest the edible plants you grow indoor. However once you reap what you sow, it will be hard to stop. You will eventually find yourself planting new seeds and take care of them until they are ready to harvest.